I am totally grabbing one of these to use as a sign in book for my daughter’s upcoming Bat Mitzvah!!! 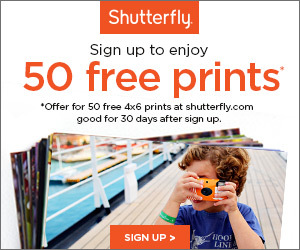 Offer is good for one free 20-standard finish page 8×8 hard photo cover photo book through shutterfly.com, our mobile-friendly site or Shutterfly apps. Offer cannot be redeemed more than once per account and/or billing address. Taxes, shipping, and handling will apply. Customer may add options to their 8×8 book (additional pages, StorytellingTM styles and elements, photo book accessories, other cover types, etc.) at additional cost. Alternatively, customer may apply the current price of a 20-standard finish page 8×8 hard photo cover photo book (after taking into account any current discounts on shutterfly.com) toward the purchase of a larger photo book. Not valid on 5×7, 7×9, or 8×8 soft cover photo books, TripPix, prepaid plans, other products and prior purchases. Cannot be redeemed for cash or combined with other offers or credits. Not valid for resale.